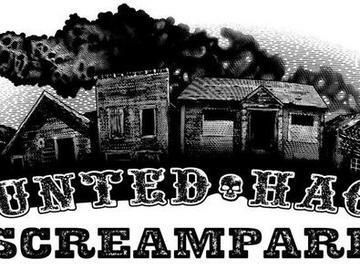 Welcome to Haunted Hagan Screampark in Rancho Cordova, California! This Halloween event is like nothing else on the west coast. We have combined the two most popular and critically acclaimed haunted houses in the area, with an unnerving train ride through the haunted woods. When you board your train it will take you back in time, back to the brutality, the greed and the filth that was the old west. Just remember to keep an eye out for the walking dead... and you just might make it out alive! Pre purchasing tickets online saves you time at the ticket booth and every online ticket purchased earns you one Deadlands dollar to spend at any one of our concession stands. No refunds, leave your valubles at home. E-ticket required for admission.